While life can get busy and our attention is on the more important things going on, it’s still no reason to let your home fall into disrepair. All it takes is one lousy winter – or an incredibly hot summer – and your home’s siding can start showing the signs of a hard life. Having to deal with home repairs is just yet another thing you have to squeeze into your hectic schedule. However, Denver siding replacement is essential, and getting on top of it sooner rather than later is crucial. But, how do you know your siding has reached the point of no return? When is it time to call upon Denver siding repair experts such as Gravina’s Windows & Siding? We’ve included five tips below to help you decide whether now is the right time for siding replacement here in Denver. The weather in Denver can fluctuate, as can your power bill, but if you’ve lived in your current home for several years, you’ll no doubt have a fair idea of what you’re paying. However, if your bill in recent months has crept up to the point of being almost unaffordable, there’s a high chance your home’s exterior could be to blame. Weather in Denver can be harsh, but it’s not severe enough to warrant extortionate heating and cooling costs. If you’re still not sure, call in your power provider to look for problems in your circuit. If you still can’t get to the root of the problem, do a check on your property. Is your siding in excellent condition, or is it rotting away? The rotten cladding is more than likely the cause, and you’ll need to call Gravina’s Siding and Windows to have the problem sorted out right away. Several intense summers or wet winters can take their toll on your home’s siding. If you believe some of your siding is warped or rotted, it’s time to take a closer look. Use a knife or a skewer to check the boards for durability. If they’re soft or you’re able to split the board, it’s definitely time for repairs. There are several different options for replacement, so now’s also an excellent opportunity to opt for something a little more durable than what you currently have. If you’ve noticed in recent weeks that your interior wall paint or wallpaper is peeling, bubbling, cracking or chipping, there’s a high chance water is getting through your exterior siding. Before more damage can occur, it’s essential that you call in siding replacement experts. The longer you leave the problem, the more expensive it will be to fix. Mold and mildew can also start forming which can be detrimental to the health of your family. In fact, you’re 40 percent more likely to have asthma if you live in a home with mold or damp air. If you’ve noticed there are little holes in your exterior siding; you need to take action. Not only is it likely that you’re about to experience an insect infestation like never before, but you’re also permitting entry for snow, rain, ice, and extreme conditions. While siding in good condition can handle the elements, old siding that’s broken and porous cannot. Paint on a home’s exterior should last around five years. Granted, this can differ depending on the brand of paint, but as a rule of thumb, you can expect your home to look fantastic for this amount of time. 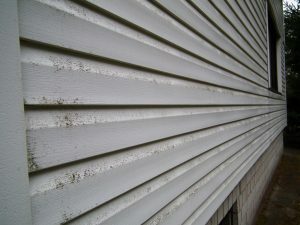 However, if you’re noticing that your siding is cracking, peeling or splitting long before then, your paint might be hiding more significant problems. Once again, grab a screwdriver or a metal skewer and check your siding for soft patches or rot. Your paint could be hiding a host of problems that you need to fix immediately. The rough weather is about to set in, and there’s every possibility your home’s siding just can’t handle more intense weather. There’s no time like the present to contact Gravina Siding and Windows to get your siding problems sorted now.